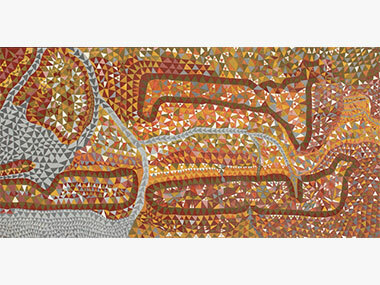 With the first-ever win by an Aboriginal artist – 65-year-old Ben Ward from Kunnunurra, WA – of the $10,000 John Fries Award last year, the organisers are keen to receive even more entries from Indigenous Australian and New Zealand artists for the 2016 Award. It has just opened for entries. Curator Oliver Watts wants to work closely with remote art centres and Indigenous curators to help find and uncover the next wave of talent. “The John Fries Award is really about a providing a platform of discovery. It gives emerging artists the chance to gain first-hand experience of working with a curator, become better networked with others in the industry and have their work seen by thousands of people through an exhibition and online gallery. This kind of exposure will help open doors to future opportunities,” he says. “The John Fries Award team is proud to have such a strong history of Indigenous work in the exhibition and we have been happy to see these artists leverage the award to greater success,” Watts says. 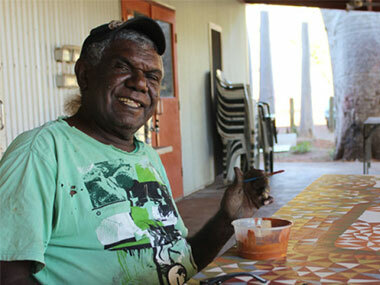 “Indigenous art has an incredibly important place in the contemporary art scene. In the global age, Indigenous art is an exciting and vital challenge to Western orthodoxies. This year, the entry conditions call for five images that demonstrate the artist’s developing practice in their chosen discipline over the past three years. The John Fries Award is open for entry now and closes at 12 noon on Monday, 22 February. All finalists’ entries feature in an exhibition from 20 August to 1 October 2016 a UNSW Galleries in Paddington, Sydney – the award’s presenting partner for the third year running.